When Al Iaquinta upset Kevin Lee at the final UFC on FOX event in December, he sent himself rocketing up the lightweight rankings, and set himself up for another big fight in the crowded division. He’ll get that next big fight in the main event of the UFC’s May 4th return to Ottawa, Canada, where he’ll battle fan favorite contender Donald “Cowboy” Cerrone. Cowboy last fought in January, when he slowed the rise of Alex Hernandez, putting the young contender down with a head-kick and salvo of followup punches in the second round. Iaquinta believes that his experience will help him avoid meeting a similar fate when he battles the lightweight gunslinger in the Canadian capital. “Stylistically, I think that, like I said before, my youth and my experience is peaking both at the same time right now,” he said on the latest stacked episode of BJPENN.com Radio. “I’m coming into my prime as far as physicality and my experience. I’ve been in there also with a bunch of the top guys. I’ve been in there with the best. While both Cowboy and Al Iaquinta have been involved in their fair share of wars in the past, the latter says his priority in Ottawa will be quick and efficient execution. “I think it’s going to be a pretty good fight no matter how it goes,” Iaquinta said. “I’m going in there, I want to make it easy. I want to make it quick. I want to make it painless on my end. I just want to go out there and finish him in the first round. I think I have all the capabilities to do it. “I remember watching the beginning of the fight in his last one, and I was like, ‘Oh, he’s not looking too young…’ But his experience pulled him through that one and I think that I’m going to be able to put it on him pretty quick. If Al Iaquinta isn’t able to put Cowboy away early as planed, he’s prepared to go five rounds with the dangerous veteran if need be. In the past, Cowboy has occasionally gotten quite friendly with his opponents, even swapping hugs and high-fives during lulls in the action. While Al Iaquinta assures he respects his UFC Ottawa opponent, he wants to make it clear that he is not flying to Canada to make friends. “He likes that. Like he kind of like tries to fool you into thinking, ‘Oh, we’re going to have a nice fight.’ It ain’t going to be a nice fight. I’m f***ing going after him. It’s going to be all respect, but I’m not going to be hugging his grandma after and like, ‘Oh, good fight. That was great,’ you know? 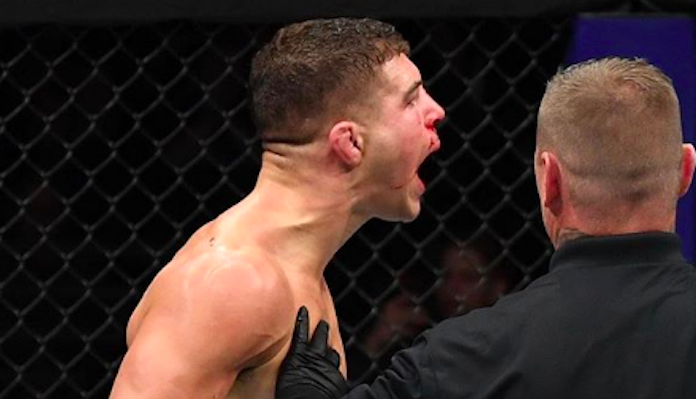 If things go according to plan for Al Iaquinta, and he out-duels Cowboy in Ottawa, he’ll emerge as one of the top contenders in the UFC lightweight division. With reigning champion Khabib Nurmagomedov suspended, and Dustin Poirier and Max Holloway soon battling for the interim lightweight title at UFC 236, The New Yorker recognizes that the path to another lightweight title shot is not particularly clear at present. That being said, he’s confident that an impressive performance in Ottawa will give him a massive push in the right direction. And that is the primary objective. If Al Iaquinta defeats Donald “Cowboy” Cerrone in the UFC Ottawa main event, where do you think he’ll stand in the perilous UFC lightweight division?